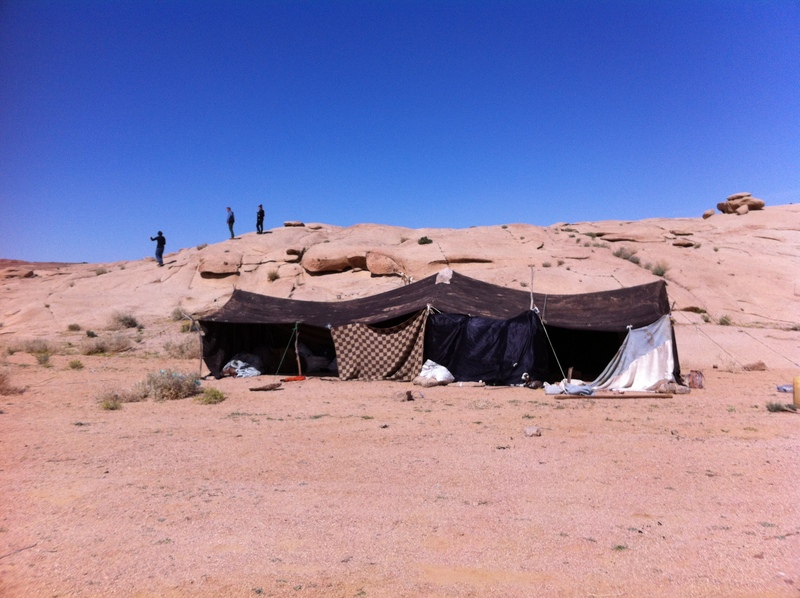 This is the “camp site” consisting of the old grandmothers private tent, Aeyida’s tent (the mother) which is divided into two parts: she sleeps with her daughters in one part, and entertains guests in the other part. Her husband lives in a town about 30 minutes away with his second wife and comes to spend time with Aeyida when he can. She also has two grown sons living in town to work, who also bring supplies when she needs them. This is the inside of the old grandmothers (Jedda) tent. She has her fireplace, mats and sleeping area, and like in any tent, the rest of her belongings hang in bags off the walls. Grandma is VERY old, and says all she really wants to do is pass away instead of just biding her time on this earth. It is hard to tell how old she is, and she doesn’t really even know herself. Time was not important when she was born. 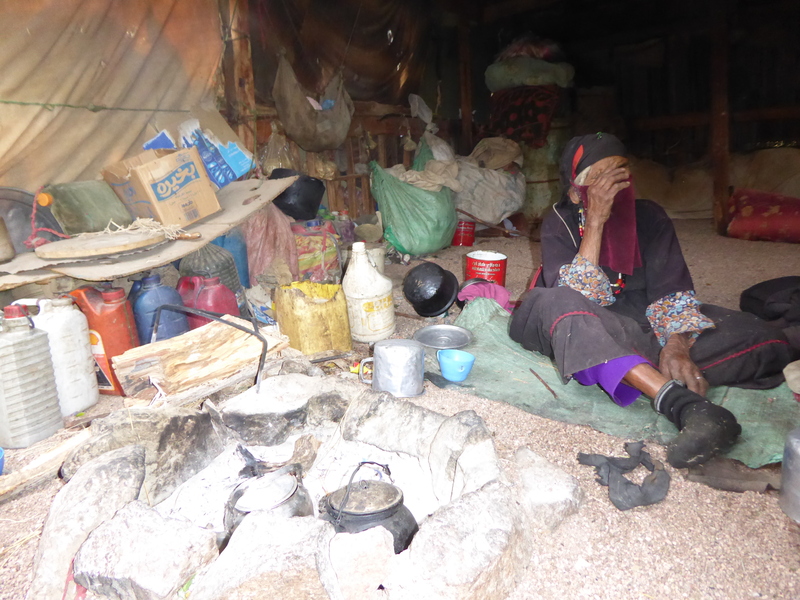 Mohamed, the 10 year old son, sleeps in her tent with her. 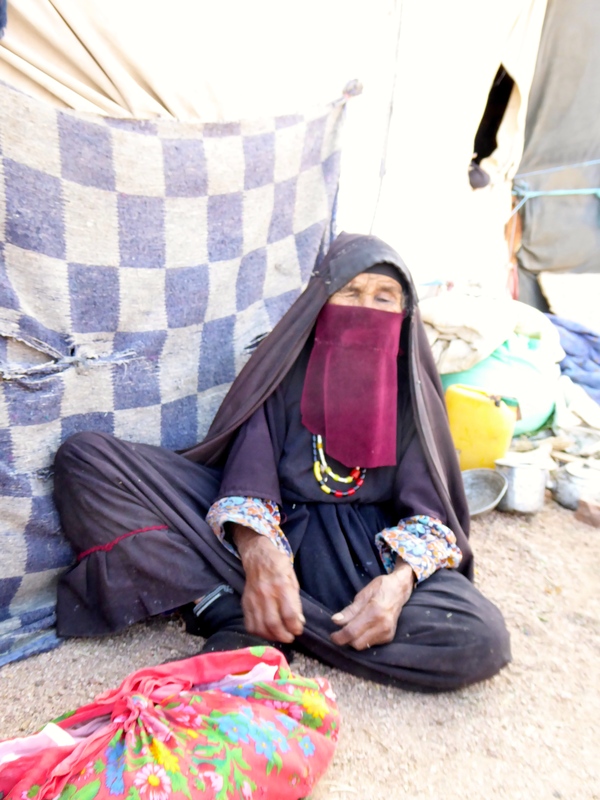 During the day she tends her goats, prays, makes tea, naps and generally hangs around her tent, sitting in the shade outside, sifting stones through her fingers. My two friends talking to Jedda. She is a real character, as old people often are, laughing us off when we told her she was still beautiful! She didn’t miss the opportunity to bring out her “bazaar” (since there were some rare “tourists” around) consisting of several tacky plastic bracelets, key rings and other trinkets, wrapped in a cloth. 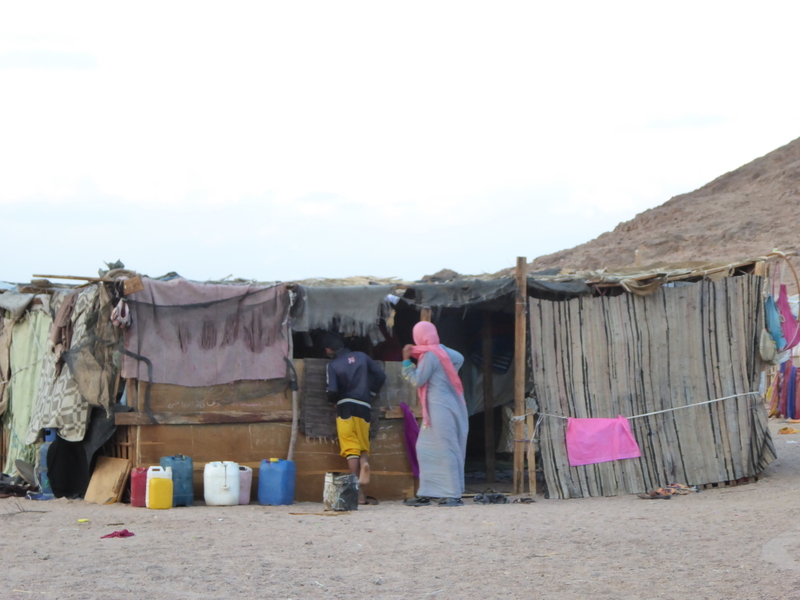 Most Bedouin women have a bazaar as they have few means to make money. Jedda about to open her bazaar and make a sale! I bought some tassley thing just to humour her, which I later gave to my cats to play with (they love it). 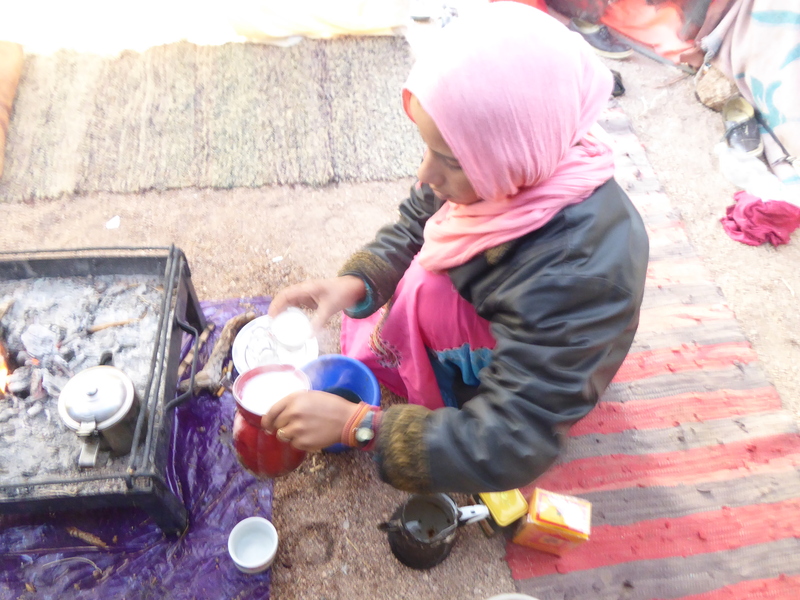 Mohamed, practicing Bedouin hospitality, invites me into Jedda’s tent and makes me a cup of sweet black tea with marmoria, a local herb, which makes the tea aromatic. The kids especially loved having us around to break up the routine. 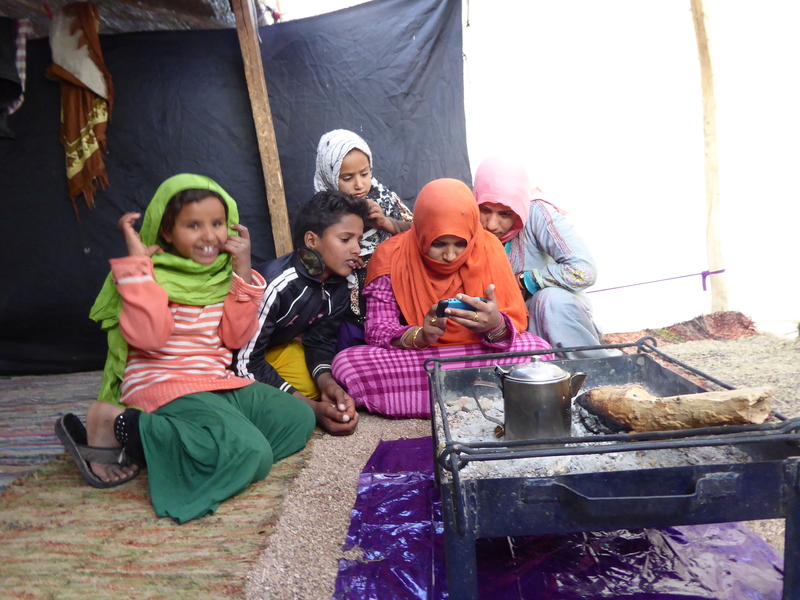 The kids loved looking at pictures of other places in the Sinai on my phone. They have no tv, so seeing other people and places is hugely interesting to them. Often in my pictures they would find photos of friends or relatives. 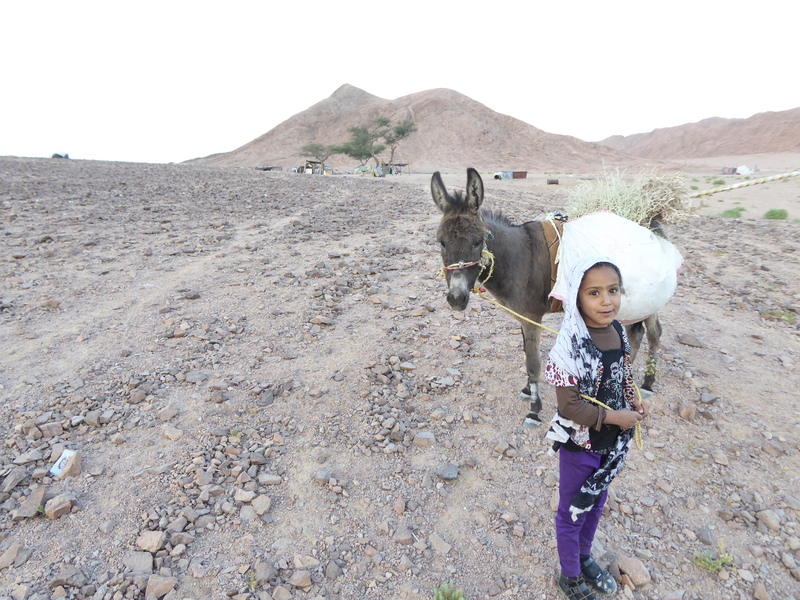 Little Fatma brings the donkey home loaded with herbs for the goats. Ra’ada outside the main tent, which has a kitchen, and a guest area. This is where we slept. The nights are so beautiful and peaceful; it is a special kind of silence at night in the desert. I slept outside the main tent under the stars one night, it’s fantastic to be so close to nature and feel the soft wind on my face at night. This is the kitchen in the main tent, neat and tidy, utensils in a rack strung from the frame of the tent. The tent walls are made of old blankets, rugs, pieces of plastic, bits of cardboard…and anything else that will make a wall! 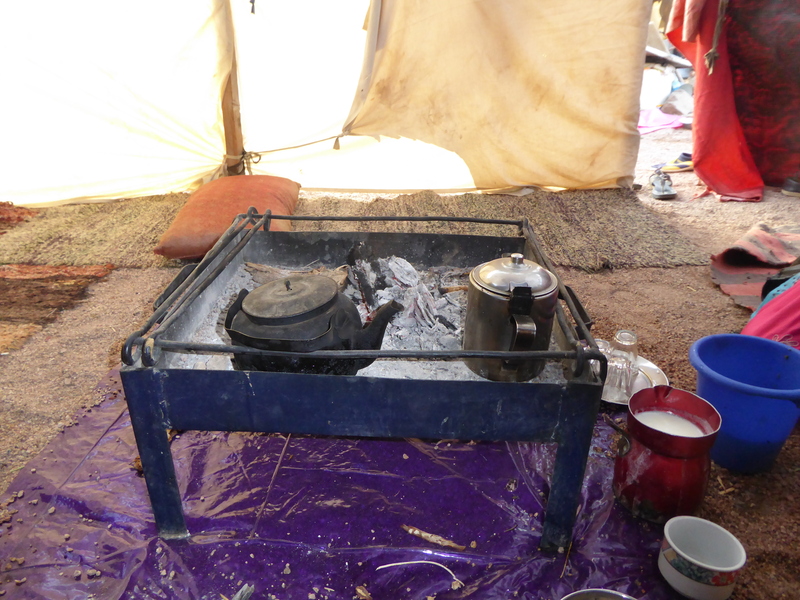 Inside Aeyida’s tent, this is the fireplace where she often entertains her guests. One night a couple of men turned up for a cup of tea around the fire. Aeyida got out her “flute” (shababa, basically a metal pipe with holes in it) and played it under her scarf so as not to reveal her face. The men sang and laughed. Later two more men turned up and then another two. It was quite a little party, with lots of singing and Aeyida playing her shababa almost continuously all evening. Out in the desert, life is freer. There is no way a woman in town could entertain 6 men without all sorts of rumours flying. The men had come in from town, some were relatives. I think they like to come out here, because life is a bit freer, and spending an evening with Aeyida is always more fun than hanging around in town. It’s definitely a serene spot to live, and after a few days out here, living the simple life, it is quite hard to leave! It is quite nice not knowing what is going on the world. Out here, all that matters is what is happening in your day. The family rises early in the desert – around dawn. 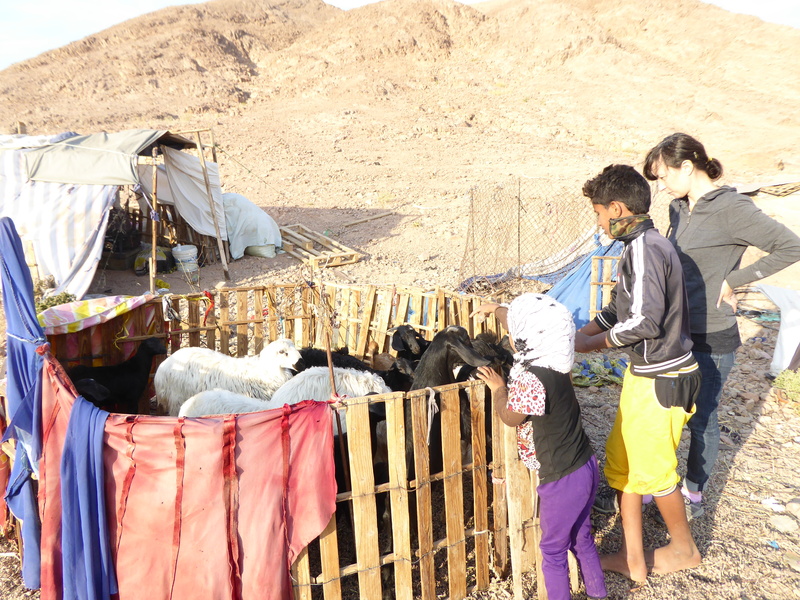 The dawn prayer is observed, and then the morning chores start – milking goats, getting them out of their pens, feeding the baby goats who have been separated from their mothers for the night (and before they go out to graze for the day), baking bread and cleaning out the goat pen. 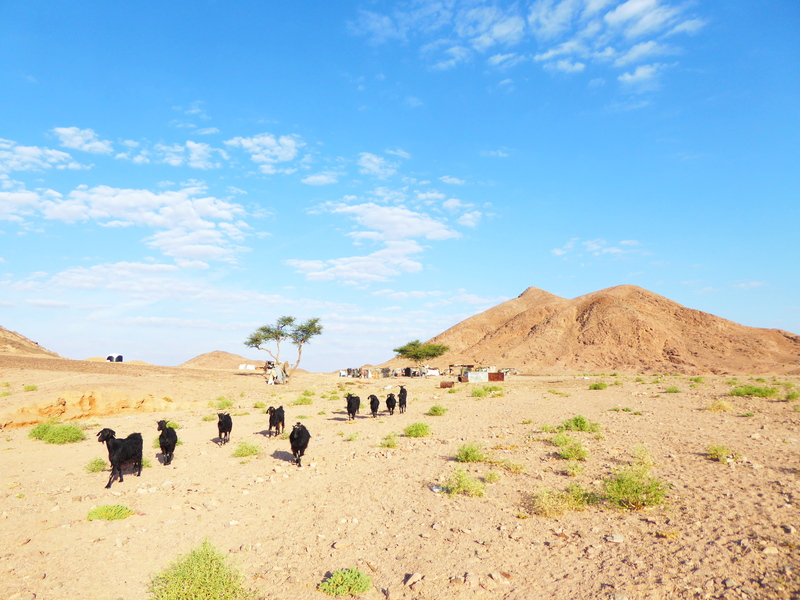 After breakfast, one of the older girls heads off into the desert for the day with the goats. The goats graze all day on the various desert herbs. They have a pretty good life out here, with fresh food, fresh air, and lots of exercise. The goat herder girl carries with her (or on the back of the donkey, rather) water, tea and sugar and something to make lunch. She finds an acacia tree to while away the afternoon under, making a fire to make some tea, and preparing a lunch of tomato salad, bread baked in the fire, and babaganou (aubergine cooked on the fire and mixed with tahina, lemon and garlic). Ra’ada bakes fresh farashih (Bedouin bread) on the fire in the morning, as the sun rises over the mountains behind her. Jedda takes an afternoon nap outside her tent. She doesn’t even bother pulling out a rug, she is quite content to just lay in the sand. A true woman of the earth! In the morning Ra’ada makes us a glass of hot goats milk with sugar. Tastes really good too! 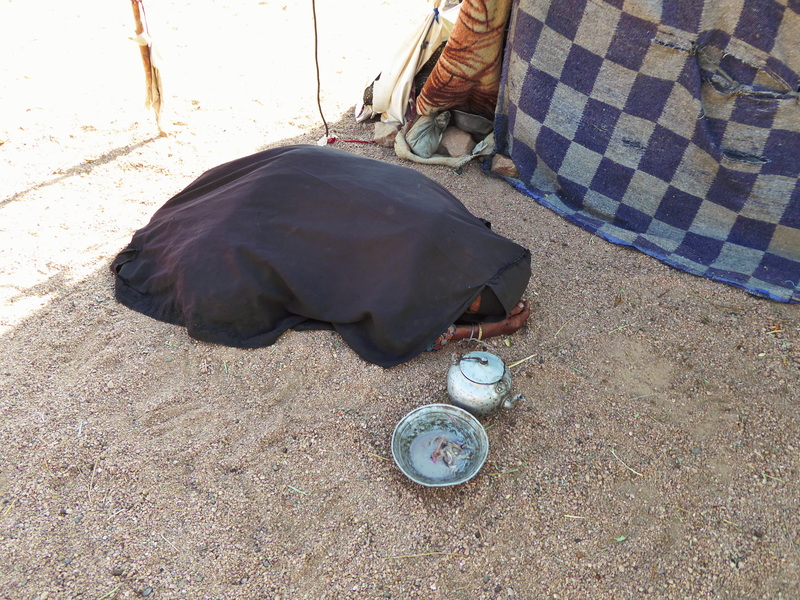 This is one of the tents they used to live in when they lived far out in the desert, made of woven goat and camel hair and called Beyt Shar (house of hair). 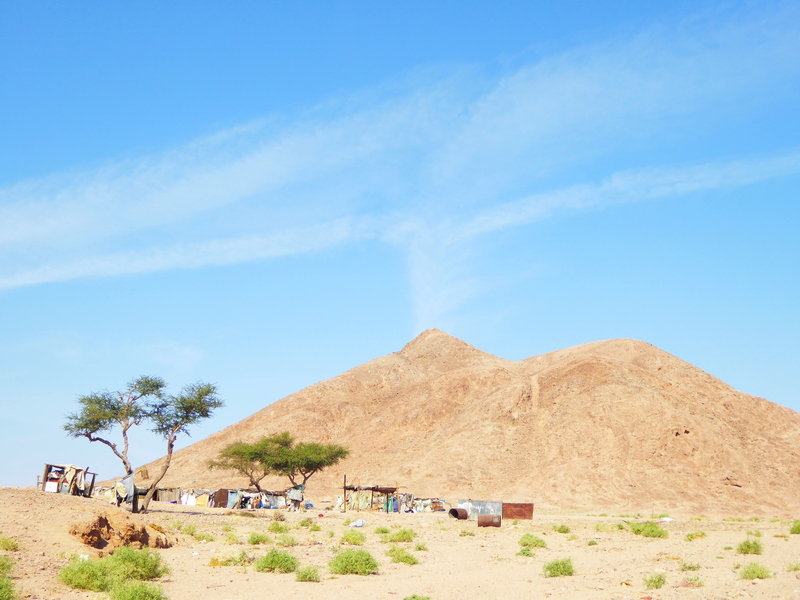 There is not much cellphone reception in the desert. Phones are placed in strategic places where there is some reception. Here the phone is on a stick inside a plastic water bottle. If the phone rings, you have to RUN to get it before the caller gives up and hangs up! On our final morning Aeyida took us out for a walk with the baby goats. They were all so happy to go out with her and they galloped and pranced behind her and by her side like she was the pied piper! It was hilarious to watch. Baby goats are very cute, it has to be said! Once we got to the shade of an acacia tree, she made a fire, baked some bread, made tea and got out her shababa and played us a few tunes. The whole scene was lovely, with the baby goats frolicking around us, the bread freshly baked in the sand, and the music – it was a very special last few hours, and made it very hard to leave. Somehow we had touched each others worlds, and shared something together that money can’t buy and words can’t be found for.